Sri Lanka Plans Probe Into Alleged Atrocities During Civil War : The Two-Way The country's new government says it is thinking of a new investigation into reports of extrajudicial killings in the closing chapter of the island nation's 26-year civil war. Sri Lankan President Maithripala Sirisena waves to supporters shortly after his election earlier this month. Sirisena looks to be trying to turn a new page in the island nation, which defeated a protracted insurgency in 2009. In a further sign that Sri Lanka's newly elected president wants to deal with the country's troubled past, a government spokesman said today that a new probe is planned to investigate allegations of human rights abuses during the island's 26-year civil war. 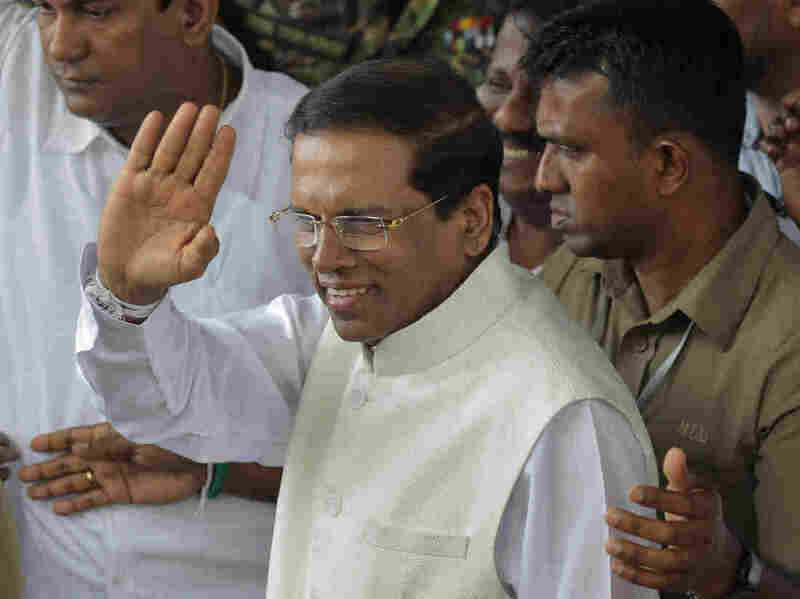 The announcement, reported by Reuters, comes as The Associated Press reports that President Maithripala Sirisena's government would return private land seized by the military to ethnic Tamils in a gesture of reconciliation. The Tamils fought unsuccessfully for an independent homeland in the island's north. "We are thinking of having our own inquiry acceptable to them to the international standards," Rajitha Senaratne, a government spokesman, told a forum of foreign correspondents in Colombo, referring to the United Nations, according to Reuters. "It will be a new local inquiry. If we need, we will bring some foreign experts," Senaratne said. Former President Mahinda Rajapaksa, who after a decade in power lost to Sirisena in Jan. 8 polls, had refused to cooperate with the United Nations in investigating claims that the Sri Lankan army committed atrocities against Tamils in the closing days of the civil war in 2009. Reuters notes: "Without some accountability for civilian deaths, the United Nations argues there will be no lasting reconciliation to allow Sri Lanka to move on from the war that dragged on for decades." Meanwhile, the AP quotes Senaratne on Wednesday as saying that the new government does not believe that military action is enough to prevent a resurgence of the insurgency waged by the Liberation Tigers of Tamil Eelam, or LTTE. "We don't think you can stop an LTTE resurrection (just) with an army," the spokesman said, according to the AP. "So spending on security will be very moderate. "Especially for the [Tamil dominated] north, we don't think we need all that security. Our entire concept will be different," he said. "About the lands in the north ... we have already decided whatever acquired for business purposes, other than the security purposes, to give back to the owners." As we reported earlier this month, Sirisena's government has accused Rajapaksa of trying to launch an 11th-hour coup to stay in power once the election results became clear.